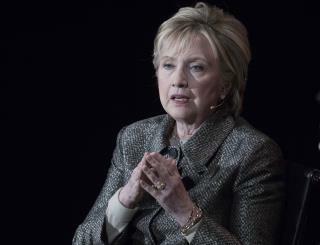 (Newser) – She may be "Crooked Hillary" to President Trump and his supporters, but Hillary Clinton has some nickname-slinging of her own to do. Specifically: "death party" in regard to the GOP. "Forget death panels," she tweeted on Friday. "If Republicans pass this bill, they're the death party." She's referring to Senate Republicans' plan to replace ObamaCare, which Mitch McConnell hopes to pass next week. His task became trickier on Friday when Sen. Dean Heller of Nevada became the fifth Republican to publicly oppose the measure in its current form. McConnell can afford only two defections. Health...schmealth. That clown-nose red "Russian Reset Button" was constipated. Photo from America's Most Wanted. "Working American legal voter repellent"